If there's one thing I do not regret spending on, its on teeth whitening! Check out my personal BEFORE AND AFTER! My only regret was that I did not do it sooner! If I did, I would have had that picture perfect smile (haha! feeling!) in all my photos these past couple of years. You see, I planned on having my teeth whitened since way back, but I kept on procrastinating. After all, professional teeth whitening can cost quite a sum. But I ran out of excuses when my Hubby, fiance at the time, decided to do something wild for Spring break and excitedly told me that he was coming home so we could get civilly married over the holidays! Since we were spending on professional photos, my primary concern was that I wanted to make sure my smile was camera ready. Problem was, I only had 2 weeks to get my teeth in bright white condition!!! Thank goodness for my friend Krissa who is a walking ad for teeth whitening! Their family dentist, Dra. Ichi Pagulayan, did a fabulous job on her that I knew she was the right dentist to go to if and when I decided to do it! Let's put it this way, she had a patient who was due for a VTR for a toothpaste commercial. After the bleaching job, her patient bagged a Close-up commercial! No kidding! Although the dentist gave me the option of laser bleaching, since that would make my teeth instantly white in a flash, it would cost me about Php25,000. So I went for the Opalescence home bleaching kit, which was Krissa's tried and tested method, and much cheaper at Php15,000. I was willing to forego seeing overnight results, if that meant saving Php10,000! Patience indeed is a virtue! During my first visit, Dra. Pagulayan made impressions of my teeth, so that a custom tray can be made for the procedure. On my next visit, she gave me the custom tray, which as it turned out, is thin and surprisingly comfortable that it fits in over the teeth, grooves and all! She also gave me bleaching gels in a set of syringes. She explained and demonstrated how to apply the gel thinly into the tray each night, for me to wear before going to bed. She also reminded me not to put gel on the molars portion as salivary glands, which are located in that area, will only cause me to keep on producing saliva, which will reduce the efficacy of the bleaching process. According to the Opalescence website, studies prove that the bleaching gel stays active for 8-10 hours during overnight bleaching. The sticky, viscous gel contains fluoride & patented micro potassium nitrate to reduce teeth sensitivity normally associated with teeth bleaching. It contains 20% water to help prevent dehydration and shade relapse. As teeth is being whitened, the Carbamide peroxide formula is broken down so that oxygen enters the enamel and dentin, bleaching out the discolored areas. 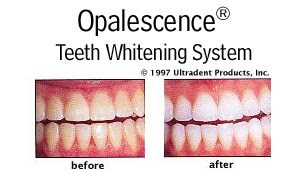 Opalescence is recommended for whitening discolored teeth prior to placement of composite, veneers, and/or crowns. It is also effective in removing some or all of the internal tooth discolorations due to congenital, systemic, pharmacologic, traumatic, etc., factors and aging. It has also shown great success with fluorosis and even tetracycline staining (which I apparently had!). Teeth whitened with Opalescence also remain lighter for years. Depending on each person's "teeth profile", results can be seen in a week to 10 days. She however warned that there is a small percentage (about 2% if I remember right) of people whose teeth are resistant to bleaching! God forbid you belong to that minority! For a while I thought I belonged to that 2%, but as the bleaching process progressed, the stubborn stains on my incisors magically disappeared and my teeth are much lighter now, if not totally white (which in my opinion would look unnatural anyway). I still have about a couple of syringes to go so I presume my teeth will still go a few shades lighter! 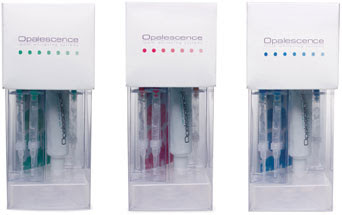 Opalescence Custom Teeth Whitening Kit at Php15,000. Available here in Manila at Dra. Ichi Pagulayan's Makati clinic. For inquiries call 896-3478. NOTE: It is NOT recommended to bleach your teeth if you're pregnant or nursing. i use crest white strip. but don't get to wear it everyday so whitening takes longer. this looks promising. do they have cheaper packages? Hi Takejiro! The cheapest package would be the Opalescence custom home bleaching kit at Php15k. hey cd! kaya pala you were so smiley when we met up for dinner. your teeth look great, and your post inspired me to finally bring out the box of crest white strips that my sister brought home from sf last december. Hahaha! Thanks Pam! =) My sisters tried Crest White Strips and they say it really works! Darn, now I feel like I got the short end of the deal! hi there. don't feel bad about having used the home bleaching kit inspite of the cost. crest strips only carry 2.5% of the main bleaching component as compared to 3.5% on the 10% gel of opalescence. with the higher concentrations now available, you will have a higher percentage of course. in other words, you will not need that much materials to achieve the whiteness that you want. opalescence also has an ingredient that prevents demineralization of enamel or "softening" of enamel. of course regardless of any method taken, there is always a chance of not reacting to bleaching. there are now more ways to bleach using the opalescence depending on your need and budget. smile always!